Just in time for the upcoming harvest season, olive growers who hand harvest their crop can now use a power-assist hand tool to manage the task. The Olive Oil Source carries an innovative olive hand harvester powered by either 12-volt DC battery or generator. It is an efficient, cost effective and reliable way to manage your harvest – no matter what size the orchard. The new hand harvester is particularly well-suited for orchards with hard-to-reach fruit, making the task of harvesting simpler and faster. It carries 2 elastic spheres with sticks, each one with individual vibrating motion and 360° coverage. 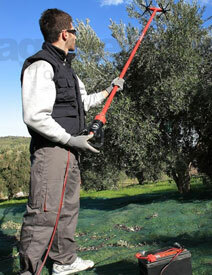 The new hand harvester is suitable for all olive tree varieties. It has high productivity rates and is available in lengths from 7 feet up to 11 feet using an extension. Its performance is optimum for both the outer and inner parts of the tree and its head enters into the densest parts without getting tangled with the branches. Most importantly, due to its motion and the soft material of its elastic sticks, the new hand harvester does not damage the branches, leaves or the fruits of the tree. Orchard access is made simple with a 26-foot power cable that is included and clips that easily attach it to a battery. A separately-available power generator can manage four harvesters at once to make the harvest process even faster. We always seek out the highest quality products to offer growers and this new hand harvester is no exception. It’s made of durable materials that require no special maintenance. Environmentally friendly with low noise levels, it’s designed for long and continuous operation with no stress on the operator. It’s comfortable to use, extremely lightweight, and easy to operate.